It’s still pretty cool and the woods pretty ‘stick-y’ here in the northern kingdom. But hope of new life and springy loveliness has begun to burst forth. 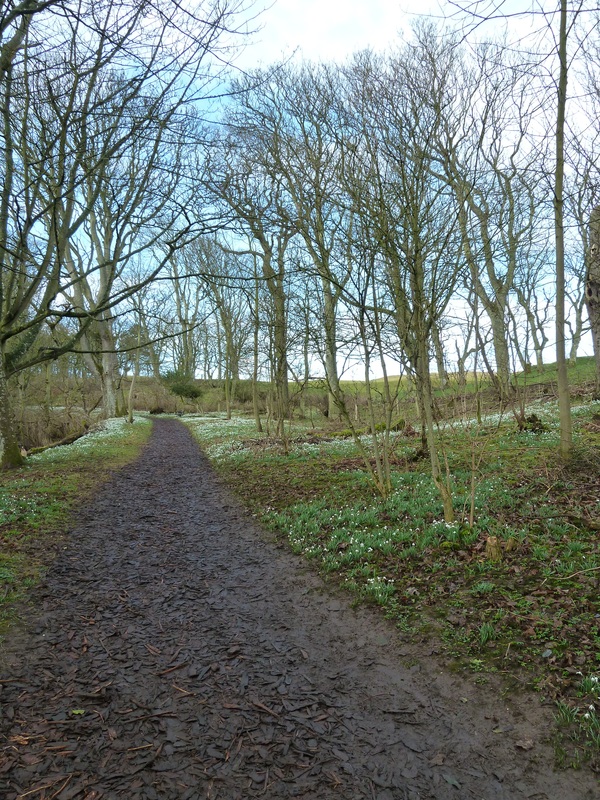 Locally, we have recently discovered the delightful Cambo estate that specialises in the cultivation of snowdrops. The past few weeks they have been in profusion – there are little clusters just outside our gate that the wee one exclaims gleefully about each time we pass them. So on the weekend past, we finally got to take a stroll in the magical wonderland of Cambo gardens. I love the delicate tenacity of snowdrops – and they put on a charming show in the moist morning. 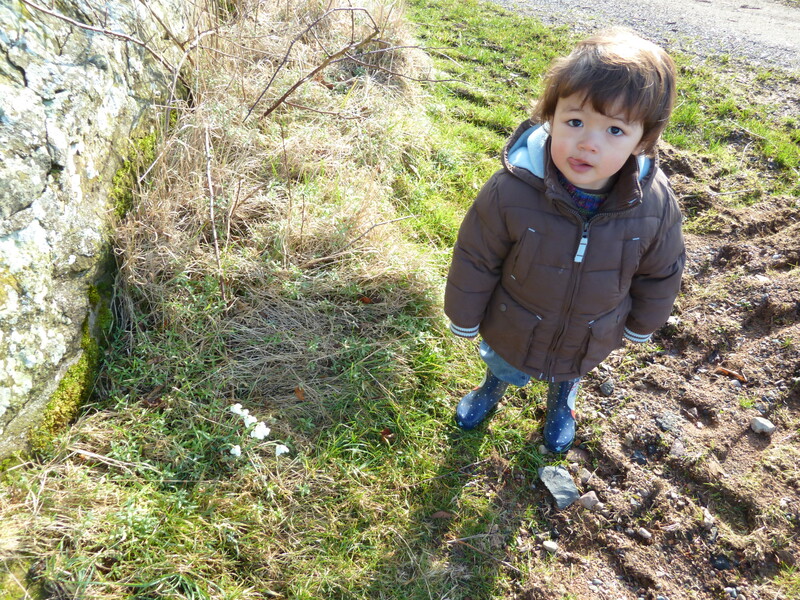 The snowdrop walk ambles down to the sea – and so Kazuo was in his element, flowers AND seaside in one outing – perfect! I am also totally taken by the tiny perfection of the minature irises that are popping up everywhere. In our neighbourhood in St Louis there were several large beds of standard sized irises that bloomed in early summer that I loved. But these wee treasures are bursting forth now and come in so many nuanced shades of blue. 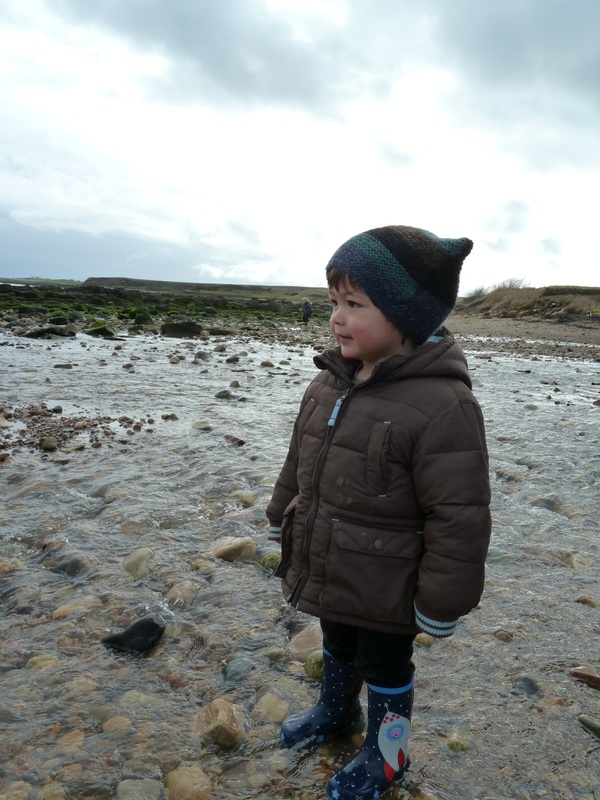 Yesterday was another sick day at our house – the wee guy has been ill with something or other for about 6 weeks now, and consequently no-one has done a full week of work or nursery since I began at the university three weeks ago. It has been tough…but he is still able to make a little trek to the gate even with the direst of lurgies. So we were both delighted to discover this teeny clump of snowdrops halfway down the drive on our wander yesterday. Spring, you are VERY welcome! I get most of my energy in the springtime. It’s like I get re-energized and all the New Years Resolutions I make good on the resolutions I made January 1st. It’s going to be almost 50 degrees today and I have a whole list of things to do. Top of the list is going for a walk to see Spring’s beauty. Thank you for pictures of early spring flowers. After the tough winter in the Midwest this year, we need to see them. To borrow and adapt your phrase… I am “totally taken by the tiny perfection of” … those cheeks! Adorable. And great pix — thank you for sharing. a delightful post. I too love the snowdrops. being a displaced (misplaced) Saffa I love spring in the UK (London). 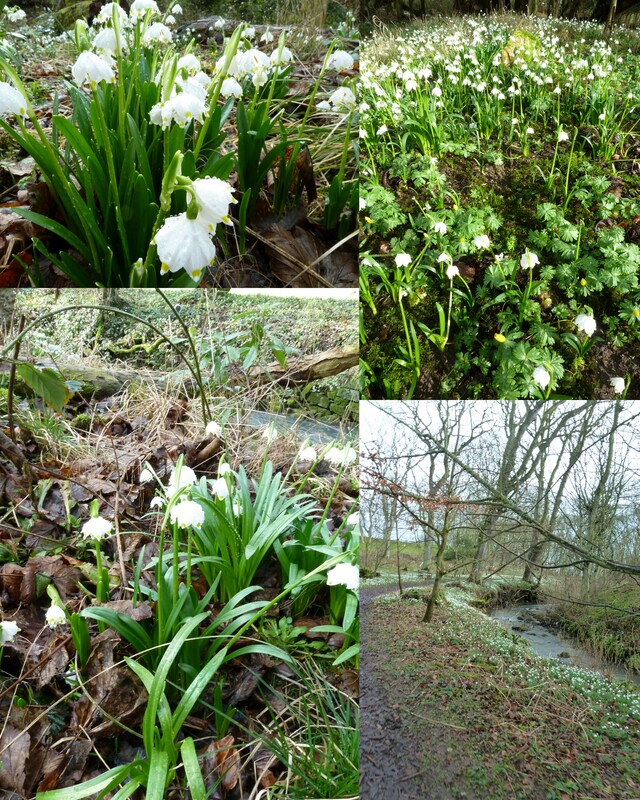 it is a joy to watch the spring flowers emerge, snowdrops, crocuses, daffodils, tulips, bluebells and many more. my favourite season! Wish the little one better soon. enjoy the season. What wonderful pictures! I can’t wait till Spring really comes on full bore. Thanks for posting this–just gorgeous. Gives me hope Spring will come eventually. It was 10 degrees here today so I am barely hanging by a thread. The snowdrops are beautiful, they are starting to spring up in our village in Italy as well, but I really love those tiny irises – they are amazing. I hope the wee person is better soon. I can almost feel and smell the air there, looking at those images. Thank you for the fresh breathe of spring beginnings. Hope your little one feels better soon. Maybe those little outings in the clean air will help. Enjoy your walks! Those flowers are beautiful! And I am jealous because here in New England we’re not going to have flowers for quite a long while yet. kid is adorable too. Thank you for having some photos of “outside” for those of us in the City! Have a greta Spring! Wow I wish the weather was like that here, we still get blizzards every day in maine! It’s nice to see a picture of spring and Snowdrops. It’s still 26 degrees in Rhode Island… this post makes me hopeful for the warmer weather! I love your sping landscape. I love your words. Pretty nice. God bless your wee guy. I cannot wait until beautiful little flowers start peeking up around here! I love spring and it can never come quite soon enough. Thank you so much for sharing your beautiful pictures. Your “wee one” is precious! Thanks for sharing your pics of those beautiful flowers. We don’t get them in our part of the world though every other flower does grow here. I’m eagerly anticipating the day the first flowers emerge in my garden. Untill then, I’ll just have to wait. Spring flowers and children go well together! I am taken by both. Did you know that their is no place closer to GOD than in a garden? I love to garden,thank you for sharing! Those wonderful pictures were simply just enough to convey that nice feeling during spring. There’s some delight watchin’ those delicately beautiful flowers. Nice post & congratulations on getting FP. Here in Australia we’re heading into Autumn (which is probably my favourite season now). In the north you have the cold weather for most of the year and I remember (having grown up in London, England) that Spring was my favourite because of the anticipation of that warm / hot weather just around the corner. The summers down under are just way too hot so now I love autumn for the same kind of reason. Her dress was sewn from crocuses,a fragrant scented gown. And on her head were bluebells, she’d placed there like a crown. Such a nice place you have her. I’ll be coming back. Gorgeous photos! The emergence of spring always fills me with hope and energy! I live just a few blocks from the Brooklyn Botanic Garden, and in the Springtime I try and visit weekly so that I can see all of the life coming forth from the flower beds. And snow drops are always a highlight of the springtime show. Thanks for your post. I wish I could say it’s spring now, but apparently it is not spring yet here. It’s still like -20 recently so hanging around outside is not a good idea yet. I love your picture about the flowers and the seaside. The water is clear and the flower shows spring is coming, at least in your area. i love seeing green come out when winter is passing such a great feeling. At least spring has sprung somewhere. All we have is rain and more cold rain. Great post and awesome photos. Congrats on being FP. Enjoyed your post and pictures. Your little one is adorable. I am sooo ready for spring! I noticed my first snowdrop yesterday and my crocuses are beginning to come up so there is hope. Enjoy your day! Those photos make me to want to return to my childhood in Russia. The long walks in the nature – you can’t even imagine how it is impressive to the kid! The snowdrops usually came with my birthday, and today is my birthday (I’m 27) – so those photos are kind of a nostalgic coincidence. Beautiful. There are no snowdrops near me. I think they look stunning alongside the pathway. Great pictures…and what an adorable little boy! Beautiful photos and sweet story of the little one…. I was a little surprised by your mention of him having “the direst of lurgies”, and then noticed that you’re a Kiwi. I wonder how the locals have taken to the lingo of Godzone??? Your writing punctuates your images beautifully! I work in a flower shop, and it’s really exciting seeing all the new spring flowers coming in. Your iris picture is stunning – it really is amazing all the different shades and hues found in nature. 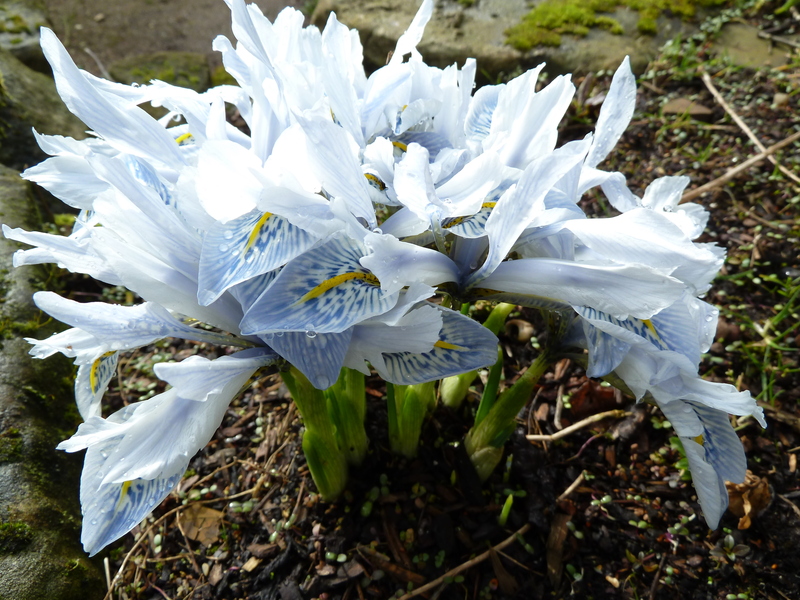 Before I started my job, I didn’t know there was anything other than the standard blue iris with a shock of yellow! Great photos! I can’t wait till spring gets here I say that every day. I love the birds chirping in the morning and the beautiful flowers. Everything is just so great about spring. Please get here soon!